An eHighway test site in California has electric-hybrid trucks connecting to overhead power lines. The sound — and smell — of thousands of idling trucks at the ports of Los Angeles and Long Beach could be fading if a new pilot project to convert them to part-time electric vehicles sticks. 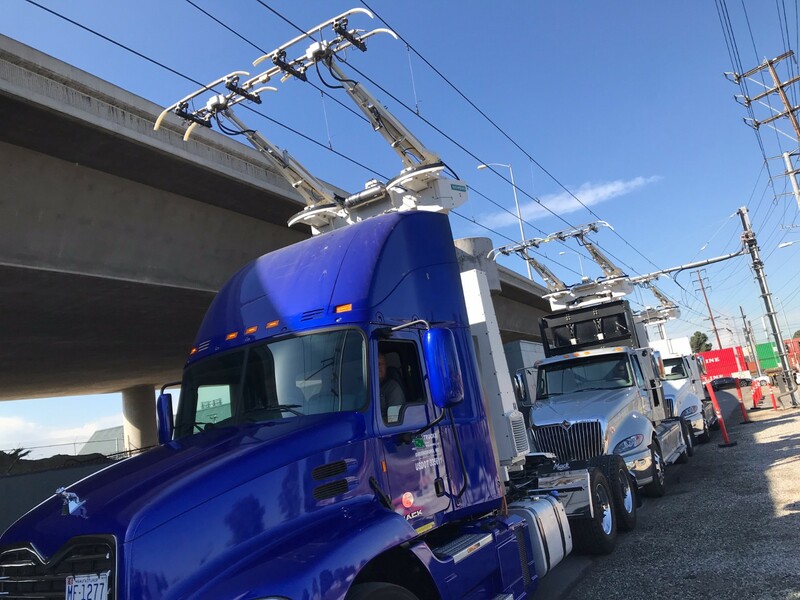 A one-mile-long test site, known as the eHighway, has been established near the Los Angeles and Long Beach ports, to test three big-rigs equipped with electric-hybrid motors and the sort of extendable arm that connects the trucks to an overhead power supply. The vehicles are powered via a Siemens overhead catenary system, much in the same way that electric city buses and trains receive power. The project, which is set to run through the end of the year, is a joint effort by Siemens and the South Coast Air Quality Management District (SCAQMD), which oversees air quality improvement projects in Southern California, an area with a long history of high smog and pollutant levels. According to Siemens, trucks, like the kind that operate in ports daily, are the leading cause of smog-forming emissions in the region. The $13.5 million project is funded by $2.5 million from SCAQMD, as well as other sources which include the California Energy Commission; L.A. Metro; Port of Long Beach; and a settlement from China Shipping. The Port of Los Angeles — located next to the sprawling Port of Long Beach, in San Pedro Bay — reported record clean air gains in 2016, surpassing its 2020 goal for reducing emissions at the port. Much of the improvement came from reducing ship emissions, the port reported. Nitrous oxide emissions from trucks are on target to be reduced 74 percent to 91 percent by 2025, according to the South Coast Air Quality Management District’s Clean Air Action Plan (CAAP). Nitrous oxide — the lion’s share of truck emissions — has been reduced 71 percent from 2005 to 2016, according to Port of Los Angeles statistics. Many of the ports’ dirtiest trucks serving the port terminals were phased out in 2008 and replaced with trucks meeting 2007 EPA standards. The port is already moving forward with a strategy to convert drayage trucks — heavy-duty trucks intended to move goods short distances from ships to warehouses — to near-zero or zero-emission vehicles. “Today, there is a fleet of approximately 17,000 drayage trucks available to service the Ports, and 55 percent of the trucks are 2007 EPA-compliant and the remaining 45 percent are 2010 EPA-compliant,” said Phillip Sanfield, director of media relations at the Port of Los Angeles, in an email. It’s not entirely clear how much CO2 or other pollutants might be reduced through the use of electric-hybrid trucks, port officials said, as a formal study has not been done. Siemens anticipates roughly 6 million tons of CO2 could be cut in California if the state were to electrify freight travel. And the electric-hybrid trucks like those on California’s eHighway test site are said to be twice as efficient as conventional diesel engines.